priest, poet and would-be physician. BBC journalist, Andrew Marr, recently described the special quality of George Herbert's poetry ('My most treasured book', The Times, 28th Sept. 2013): Although I'm not particularly religious, George Herbert is my favourite poet and at the moment I am reading him obsessively. There are various poems addressed to God, but they have a wit, liveliness and a humanity about them that is absolutely refreshing and life enhancing. Following a career that combined academia and the royal court, George Herbert (1593–1633) eventually settled as a priest of a small country parish. Here he lent his intellect to his new role, among whose duties he felt was the need for both the priest and his wife to tend the poor sick. ​Correction: In the article text GH's dates should read '1593-1633'. Header images: Portrait of George Herbert in Bemertion by William Dyce, 1851 Tate Gallery, London/Gerard's Herbal, 1597. Herbs vol. 38 no. 3, Sept 2013. 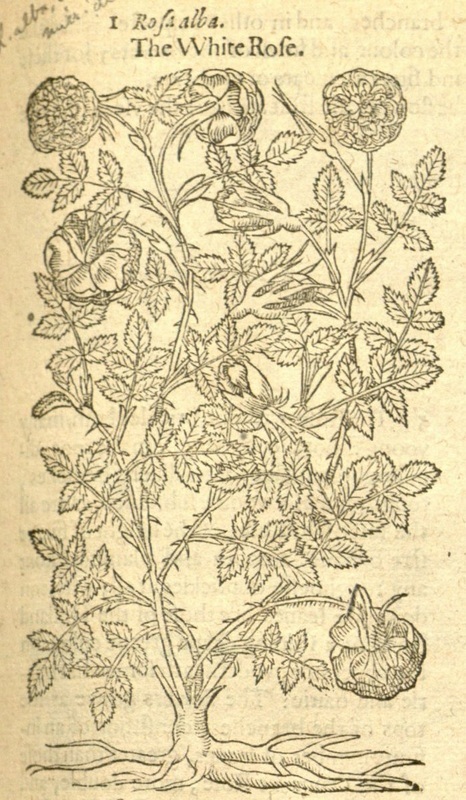 John Gerard's Herbal and George Herbert. 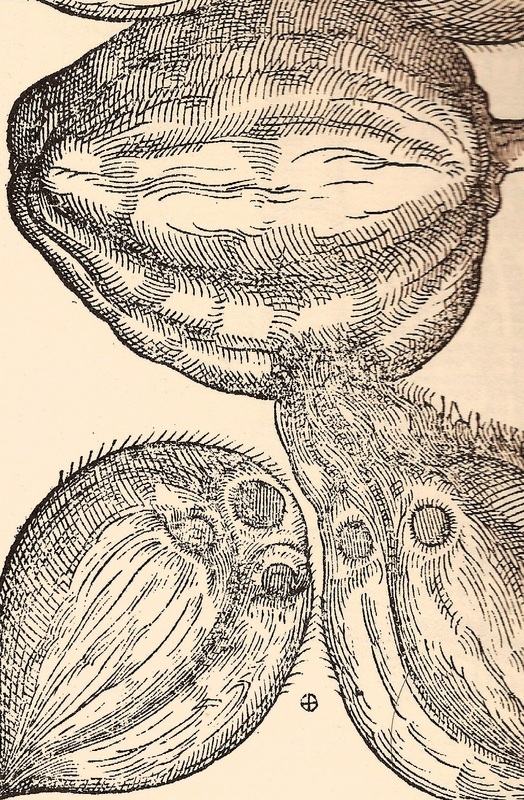 No herbal is totally original in content, John Gerard’s The Herball, or, Generall historie of plantes (1597) is based on the earlier Cruydeboeck (1554) by the Flemish physician and botanist Rembert Dodoens. This very popular text already had a French translation (Charles de L'Ecluse, or Clausius) and a previous one in English (Henry Lyte) and by the time Gerard’s appeared there was also Latin edition by Dodoens himself. All of these versions would have been accessible to the linguist Herbert and through such texts as this he could claim in a literal sense, though little travelled himself, that ‘I know the ways of learning/Both th'old discoveries and the new-found seas’. Boat, cable, sail, and needle, all in one. Here is part of Gerard's description of the same tree, ‘the timber whereof is very spungie within, but hard without, a matter very fit to make their Cannoos and boates of: (the leaves are) sharpe at the point as thornes, whereof the use to make needles, bodkins, and such like instruments, wherewith they sowe the sailes of their ships.’ (see also the picture caption opposite). ‘I know the wayes of pleasure’ Herbert confessed ‘My stuffe is flesh, not brasse; my senses live’. Like his contemporaries he valued the rose both aesthetically and medicinally. In The Rose he contemplates at length this dual image, in a way that was to be judged objectionable to later, more sensitive generations and rather strange to us; ‘What is fairer then a rose?/What is sweeter? Yet it purgeth’. As befits a herbal text, Gerard acknowledges the rose as ‘the most glorious flowers of the worlde’ but is practical about its useful properties: ‘soft, gentle, loosing, opening and purging gently the belly’. "Jane Herbert asked Woodnoth to get Ferrar to send her 'the receipt (recipe) for the balsam and any other, it would very acceptable (the Oil of Elder she has)'." 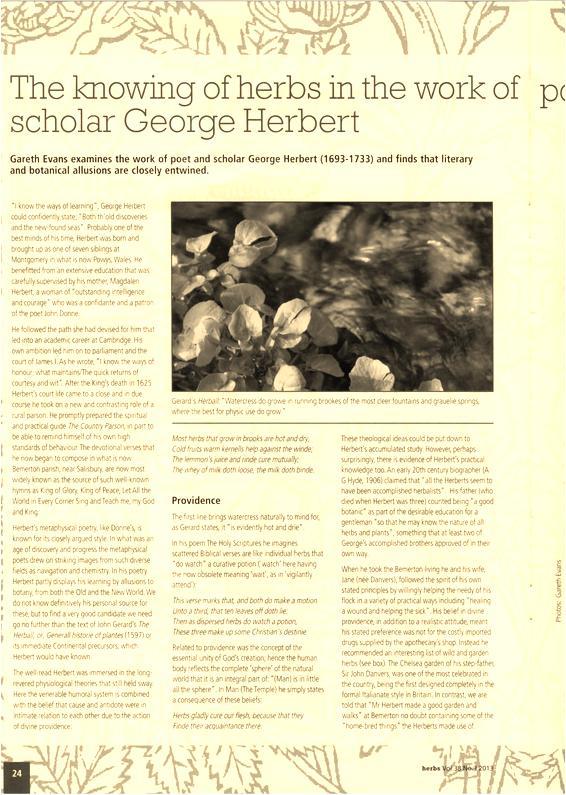 Poems of George Herbert at The Poetry Foundation. A Priest to the Temple: or, The country parson.